On a cold and windy day do it like the Swiss: Sit down and relax at dinner time and enjoy a raclette meal with your loved ones. Raclette is a great meal to have when you don't want to stress out and still provide everyone with exactly what they like. So, have a look at our products and prepare right now for your next big family reunion! Why wait if you can enjoy raclette right now! See below which items are currently available via this website and in stock. For items not available right now, if you want you can contact us to be put on the waiting list. Currently out of stock! Low stock, order now! In stock, order now! Currently out of stock! Currently out of stock! It is in economic hard times that people remember what quality is: Products that fulfill an important need and that outlast their competitors, that are value for money. 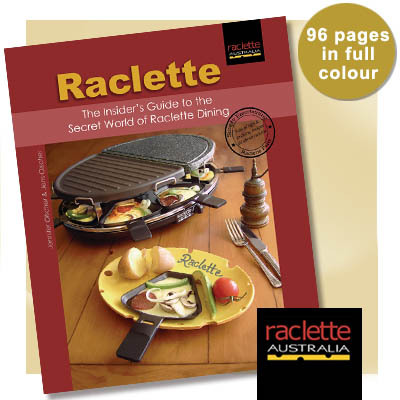 This is why Raclette Australia products are now in higher demand than ever before. We had numerous customers mentioning to us that they obtained low quality raclette grills through other sources and had to throw them away after only a short time due to their low quality. After purchasing our products they were delighted to see the very high standard of quality that we have for our raclette grills and referred friends to us. Thank you very much to those customers. Our pledge is that we will remain focused on high quality products that satisfy the needs of our customers and are true value for money. Since 2005 we managed to keep the postage and handling fees stable for our customers, but as you know transport costs have risen even faster than inflation. So, we now will pass on these costs directly to you instead of having one flat postage fee for entire Australia. We think this is a fairer solution to those living closer to Sydney. 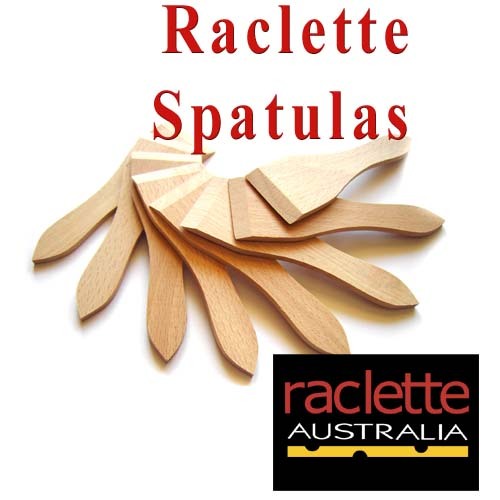 We also noticed from customer feedback that many of you do not need the wooden spatulas as the raclette pans are non stick or you still have spatulas from previous raclette grills. 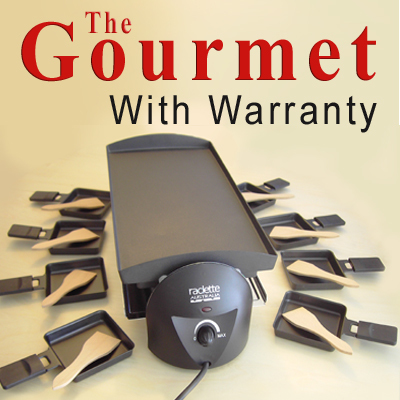 Therefore we now sell the spatulas separately and can reduce the prices of our raclette grills. Should you still need wooden raclette spatulas please purchase them separately. Due to all these price adjustments we have currently disabled our fast ordering system until it is updated with the new values. You can still order all our products by contacting us directly. We now have three models available to you. 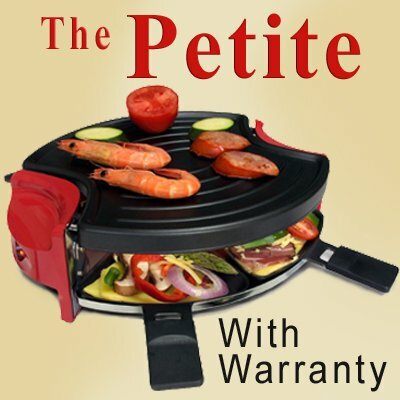 The Petite, our raclette grill with four pans, is priced at only A$99 plus postage. Buy just one for yourself or gifts for everybody! This grill is also ideal if you have a long table and want to distribute the joy of raclette by using two of these great space savers! 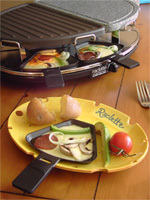 Order your raclette grill here. We also have two other great models available for you, both come with eight individual non-stick pans (should you need wooden raclette spatulas please purchase them). To suit all table forms we have the rectangular model The Gourmet and for round tables The Entertainer! And for all those who don't know yet what a raclette grill is and how much fun one of these legendary raclette parties can be: read on! We have currently three models available: Our raclette grills The Petite (RRP A$99), The Gourmet (RRP A$155) or The Entertainer (RRP A$174). Postage and handling charges will be calculated for your delivery address and emailed to you. Please contact us to order your raclette grill. If you want to entertain your guests in a unique way, have a raclette party. This website will help you get everything together for a successful dinner party, special occasion, informal get-together or simply a very enjoyable family dinner. It's so easy to create a cosy and fun atmosphere at your chosen venue with a raclette grill that you will ask yourself how this managed to remain a secret for so long (about 500 years, actually...). A raclette grill is a very versatile grilling appliance that sits in the middle of the dining table where up to eight seated guests are able to cook in front of them. Perfect for cosy and warm informal get-togethers. All you need to do is to buy some basic ingredients to create easy, warm and scrumptious cheese based meals directly at the table. Raclette grills take the stress and work out of catering for small or large groups. This multipurpose machine can whip up quick and delicious meals that will make your occasion a real winner. Discover how it can easily become your favourite way to celebrate. So, have a raclette party with your friends! 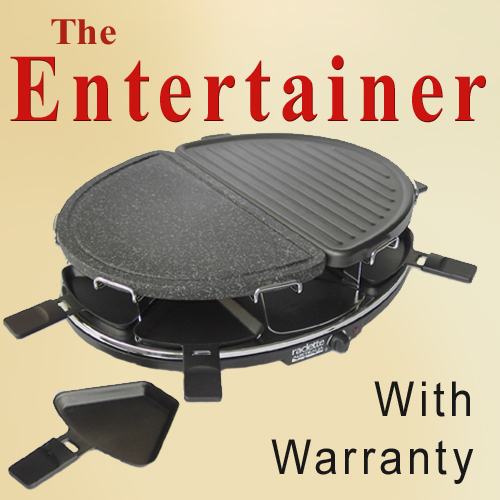 And buy yourself a raclette grill You can now purchase any of our raclette grill models The Petite (A$99), The Entertainer (A$174) or The Gourmet (A$155) right here on this website. Postage and handling fees apply, please contact us to order your raclette grill and then wait for your email.